What began as a small effort by Pasadena’s distinguished Valley Hunt Club to promote the city’s charm and beautiful weather, the Tournament of Roses has since become America’s New Year Celebration. In the winter of 1890, the club members brainstormed ways to promote the “Mediterranean of the West.” They invited their former East Coast neighbors to a mid-winter holiday, where they could watch games such as chariot races, jousting, foot races, polo and tug-of-war under the warm California sun. The abundance of fresh flowers, even in the midst of winter, prompted the club to add another showcase for Pasadena’s charm: a parade to precede the competition, where entrants would decorate their carriages with hundreds of blooms. In 1895, the Tournament of Roses Association was formed to take charge of the festival, which had grown too large for the Valley Hunt Club to handle. The Tournament of Roses has come a long way since its early days. The Rose Parade’s elaborate floats now feature high-tech computerized animation and natural materials from around the world. Although a few floats are still built exclusively by volunteers from their sponsoring communities, most are built by professional float building companies and take nearly a year to construct. 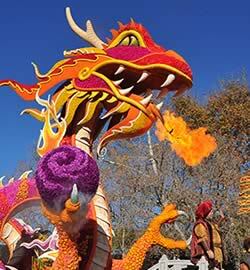 The year-long effort pays off on New Year’s morning, when millions of viewers around the world enjoy the Rose Parade.  More than 80,000 hours of combined manpower is supplied by 935 volunteer members of the Tournament of Roses Association. Each volunteer is assigned to one of 31 committees, with responsibilities ranging from selecting parade participants to directing visitors on New Year’s Day, to serving food to band members at the end of the parade route, to giving presentations about the Tournament to community groups. Nicknamed “White Suiters” because of the distinctive white uniform every volunteer wears, these community-spirited men and women give up their evenings, weekends and holidays to ensure the success of the Parade and Game. A small full-time staff provides support and continuity to the volunteer organization. This event began as a promotional effort by Pasadena’s distinguished Valley Hunt Club. In the winter of 1890, the club members brainstormed ways to promote the “Mediterranean of the West.” They invited their former East Coast neighbors to a mid-winter holiday, where they could watch games such as chariot races, jousting, foot races, polo and tug-of-war under the warm California sun. The abundance of fresh flowers, even in the midst of winter, prompted the club to add another showcase for Pasadena’s charm: a parade would precede the competition, where entrants would decorate their carriages with hundreds of blooms. The Tournament of Roses was born. The first Tournament of Roses football game, which was the first post-season football game in the nation, was staged at Tournament Park on January 1, 1902. The game matched the West Coast’s Stanford against Midwestern Michigan. (The teams would later become members of today’s Pac-12 and Big Ten conferences, respectively.) Michigan routed Stanford, 49-0, prompting the football contest to be replaced with Roman-style chariot races inspired by the literary classic Ben-Hur. Football was permanently reinstated as part of the Tournament’s traditions in 1916. The exclusive agreement among the Tournament of Roses Association, the Big Ten Conference and the Pac-12 Conference was born in 1946, and the first game played under the agreement took place on January 1, 1947. The pact is the oldest intercollegiate postseason bowl agreement between two major conferences in the United States. This collegiate classic has been the occasion of many firsts.  The Rose Bowl Game was the occasion of first local radio broadcast of an East-West bowl game in 1926, the first transcontinental radio broadcast of a sporting event in 1927, the first local telecast of a college football game in 1948, the first national telecast of a college football game in 1952 and the first coast-to-coast color telecast of a collegiate football game in 1962.  In 1983, the Association created the Tournament of Roses Foundation, a non-profit corporation, to receive contributions from members, friends, supporters and the general public. The Foundation makes annual grants to non-profit organizations in Pasadena area communities by funding sports and recreation, visual and performing arts, and volunteer motivation and leadership development projects and programs. These broad categories allow the Foundation to contribute to the civic, cultural and educational advancement of Pasadena area communities. To date, the Tournament of Roses Foundation has given close to $3 million to more than 180 organizations. Wrigley Mansion, the Orange Grove Boulevard estate, serves as the official headquarters of the Tournament of Roses Association, its staff and the 935 volunteers who work year-round to organize the Rose Parade and Rose Bowl Game. The elegant Italian Renaissance-style mansion was presented to the city of Pasadena in 1958 by the William Wrigley family with the understanding that it would become the permanent headquarters for the Tournament of Roses. Chewing gum magnate William Wrigley Jr. purchased the home in 1914, after eight years of construction, for $170,000. A year later, he paid $25,000 for the adjoining property, clearing the way for what is now known as the Wrigley Gardens. In its time, the Wrigley’s winter residence was considered a more modest home on “Millionaire’s Row.” The three story mansion had 22 rooms totaling 18,500 square feet space, with the first floor dedicated to entertaining and the second floor used for living. Of the Wrigley’s six homes across the country, the Pasadena getaway was Mrs. Ada Wrigley’s favorite. She delighted in watching the parade from her own front yard. Surrounding Tournament House are the Wrigley Gardens, which feature a 4.5-acre floral display of more than 1,500 varieties of roses, camellias and annuals. The gardens feature the All-America Rose Selections (AARS) award-winning Tournament of Roses rose developed especially for the Tournament of Roses Centennial. In 1999, the Tournament of Roses Executive Committee decided, some 41 years after the home was given to the city of Pasadena, that it was time for Tournament House to be renovated and the interior freshened. As you might imagine, the number of events that are held at the house and the number of people who come annually to enjoy the house does take a toll. Due to Tournament events the work could only be done beginning in late January and it had to be finished by late August. The project took two years to complete. Tournament House and its surroundings provide a majestic backdrop for many Tournament of Roses activities, including the highly anticipated announcements of the Grand Marshal and Royal Court. The many treasures throughout the house recall past tournaments and highlight a rich history of grace and style. Tours will be offered, at no cost, each Thursday at 2 PM and 3 PM from February through end of August. Reservations are not required except for groups of 10 or more people. Groups of 10 or more may call (626) 449-4100 for tour reservations.